Join Central Bark at the third annual St. Patrick’s Day Paw Promenade. The “promenade” begins at Mercer Island City Hall and follows the I-90 trail to Luther Burbank Off-Leash Dog Park. There will be vendors (that’s us! ), demonstrations, raffles, and doggone fun activities for the whole family. Plan to walk rain or shine and bring your four-legged leprechaun. Prizes awarded for “most spirited” dogs so don’t forget to wear GRRReen! Location: Walk begins at Mercer Island City Hall, 9611 SE 36th Street, Mercer Island, Washington. The Luther Burbank Off-Leash Dog Park is located at 2040 84th Avenue SE, Mercer Island, Washington. Can’t get enough of dogs? Facebook has an application that lets you create a Facebook-like page for your dog. You can network with other dogs, post pictures, post your dog’s status, and brag to your heart’s content. Go to apps.facebook.com/dogbook. We have a celebrity in our midst. You might have heard that “Legally Blonde,” the Broadway musical hit, will be playing at the Fifth Avenue Theater. The story is about sorority star Elle Woods, an underestimated blonde who doesn’t take “no” for an answer. What you might not know is that the canine star is a Central Bark client. 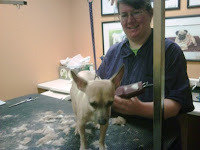 Frankie the Chihuahua (“Bruiser” in the musical)insists on getting spruced up at Central Bark for his starring role. Here’s a behind-the-scenes look at the star getting ready for his fans. Now you can tell all your friends you get your dog groomed where the stars go!